The optometrists at Sussex Eye Center utilize state of the art ocular imaging and diagnostic instruments to care for your eyes. The following are some of the technologies we use every day at Sussex Eye Center to detect, diagnose, and manage eye diseases. 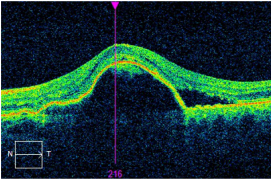 Optical Coherence Tomography (OCT) imaging uses light to image the optic nerve and retina in very fine detail. The instrument helps determine if you have eye diseases such as glaucoma, macular degeneration, macular pucker, and diabetes to name a few. Once eye disease is established, OCT imaging aids your optometrist in managing your condition over time via medication changes and/or surgical referrals. EvokeDx is our newest form of advanced specialized testing. The instrument is capable of performing Visual Evoke Potential (VEP) and Electroretinalgram (ERG) testing. These tests are instrumental in the detection and management of serious ocular diseases such as glaucoma, macular degeneration, and diabetic retinopathy. Early detection minimizes the potential for these conditions to cause damage to your vision. 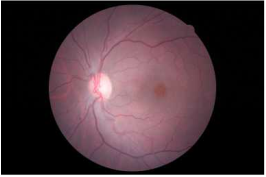 Retinal imaging is extremely important for ongoing management of many retinal diseases. Retinal photos are archived into your electronic health record. These photos can be accessed by your eye doctor at future visits to determine if your eye disease has improved, worsened, or stayed the same. Retinal images can also be sent to specialists upon referrals so they know how severe your condition was as the time of referral. Corneal topography is a procedure in which the front part of the eye, the cornea, is imaged and then analyzed via computer software, resulting in a topographical map which displays the exact shape of the eye. Corneal topography gives your eye doctor the ability to interpret the shape of the front surface of your eye. Having a detailed map of the shape of the eye allows Dr. Rebarchik to fit highly specialized contact lenses.